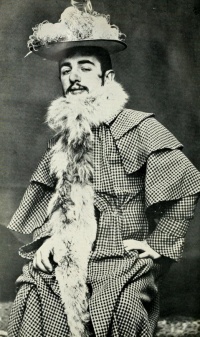 This page Henri de Toulouse-Lautrec is part of the queer series. Henri de Toulouse-Lautrec (November 24, 1864 – September 9, 1901) was a French painter, printmaker, draftsman, and illustrator, best-known for French can-can posters such as La Troupe de Mademoiselle Eglantine. His immersion in the decadent and theatrical nightlife of fin de siècle Paris yielded an oeuvre of provocative images of modern life. Under the pseudonym Tolav Segroeg, he participated in two exhibitions of the Incoherents. Lautrec has been declared to be "The soul of Montmartre", the Parisian quarter where he made his home. He often portrayed life at the Moulin Rouge and other Montmartre and Parisian cabaret and theaters, and, particularly, in the brothels that he frequented avidly (allegedly, he contracted syphilis from the prostitute Rosa la Rouge, who lived in a brothel). He lived there for long periods among the women that adopted him wholeheartedly and made him their confidant and the witness of their most intimate acts that inspired the lesbian scenes of many of his drawings and paintings. He painted singer Yvette Guilbert, Louise Weber, known as the outrageous La Goulue, the glutton, a dancer who created the "French can-can", and dancer Jane Avril. Toulouse-Lautrec gave painting lessons to Suzanne Valadon, one of his models (and, by all accounts, probably his mistress as well). An alcoholic for most of his adult life, he was placed in a sanatorium shortly before his death. He died from complications due to alcoholism and syphilis at the family estate in Malromé, fewer than three months before his 37th birthday. Throughout his career, which spanned less than 20 years, Toulouse-Lautrec created 737 canvases, 275 watercolours, 363 prints and posters, 5,084 drawings, some ceramic and stained glass work, and an unknown number of lost works. His debt to the Impressionists, in particular the more figurative painters Manet and Degas, is apparent. His style was also influenced by the classical Japanese woodprints which became popular in art circles in Paris. In the works of Toulouse-Lautrec can be seen many parallels to Manet's detached barmaid at A Bar at the Folies-Bergère and the behind-the-scenes ballet dancers of Degas. He excelled at capturing people in their working environment, with the colour and the movement of the gaudy night-life present but the glamour stripped away. He was masterly at capturing crowd scenes in which the figures are highly individualised. At the time that they were painted, the individual figures in his larger paintings could be identified by silhouette alone, and the names of many of these characters have been recorded. His treatment of his subject matter, whether as portraits, scenes of Parisian night-life, or intimate studies, has been described as both sympathetic and dispassionate. Toulouse-Lautrec's skilled depiction of people relied on his painterly style which is highly linear and gives great emphasis to contour. He often applied the paint in long, thin brushstrokes which would often leave much of the board on which they are painted showing through. Many of his works may best be described as drawings in coloured paint. In the John Huston film Moulin Rouge (1952), he is portrayed by José Ferrer. Lautrec (1998) is a biographical movie directed by Roger Planchon. In the 2001 film Moulin Rouge! Lautrec is portrayed by John Leguizamo. In the Woody Allen film Midnight in Paris (2011), he is portrayed briefly by Vincent Menjou Cortez. Sacre Bleu (2012) written by Christopher Moore, is a work of fiction in which Lucien Lessard works with Toulouse-Lautrec to solve the mystery of Vincent van Gogh's death. Moulin Rouge (1950), a biographical novel by Pierre La Mure, follows Lautrec through his whole life and contains vivid impressions of his family, his circumstances, and the milieu in which he lived and worked. Unless indicated otherwise, the text in this article is either based on Wikipedia article "Henri de Toulouse-Lautrec" or another language Wikipedia page thereof used under the terms of the GNU Free Documentation License; or on original research by Jahsonic and friends. See Art and Popular Culture's copyright notice. This page was last modified 10:31, 5 February 2015.